Newcomer NLU Delhi earned a whopping thirty points to lead the MPL 2 standings after defeating the veteran NUJS Kolkata mooters in Sunday’s finals of the Surana & Surana Jessup North India Rounds. NUJS Kolkata also won the best memorandum award to take away twenty points from this crucial moot, moving up to second position with a comfortable lead of fourteen points ahead of NLIU Bhopal. Both teams will represent North India in the White & Case Jessup World Finals to be held in Washington in March. 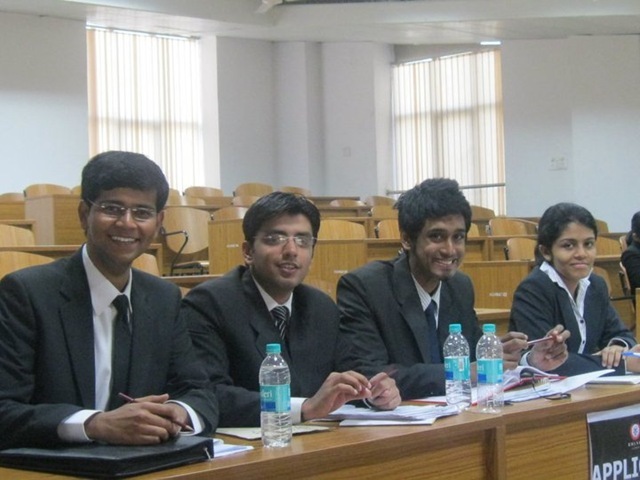 Amity Law School, Delhi and CNLU Patna emerged as semifinalists in the competition and earned five points each. The North India Rounds were conducted by Surana & Surana International Attorneys in association with RMLNLU Lucknow. Akshay B.D. from NLU Delhi won the best speaker award, with the rest of the team of third year students consisting of Shreya Rastogi, Ankit Chauhan and Sarvjeet Singh (pictured). The NUJS team consisted of Deepak Raju, Rukmini Das, Iram Huq and Pankti Vora. The problem dealt with the legality of drone strikes and international anti corruption law. Nineteen teams worked for around five months to qualify for this popular moot, which is also known as the ‘World Cup of Mooting’. The South India Rounds are scheduled to be held next weekend at KIIT Law School, Bhubaneswar. Congratulations to both NLU, Delhi and NUJS. Well done! Its time one of the Indian schools gets the world title again (same goes for Vis, Vienna). Hope its this year! It is quite amazing how NLU Delhi has come up in such a big way in such a small period of time! Congrats NLU Delhi! would have more respect for nlu delhi's win if not for the fact that they have express faculty to 'coach' for mooting. that is ridiculous and completely against the trial/error learning-curve spirit of mooting. you will probably call me bitter and say i'm afraid of change, but i am of the old guard of mooters and would like nothing more than to be replaced by brilliant young 'uns so that mooting - continues to be a popular, fun activity that my college continues to dominate (:P). not in this way, though. hey if ur the old guard of mooters..wouldnt u know that if any person does not research the thing he speaks and completely relies on another person to tell him what to do and give substantive help, he would not be able to answer the firing questions judges put across to him? thats the exact reason judges ask questions..it is to test their knowledge which going by what u say is useless...though u are entitled to ur opinion kindly do not make it derogatory. @#4 Echoing what #5 said, It completely ridiculous for you to beleive that NLU Delhi one because an express faculty coaches them. No amount of so-called expert help can be of any use if you yourself have not slogged to be able to handle judges question. If you are against any type of guidance then i think you do not understand the concept of studying in a university itself. NLU Delhi has had on seniors, they had no one with experience to teach them the tricks of the trade, a visiting coach can make little difference. If I am correct, there will be more than 8 moots of MPL in feb, 2011. It gonna be decider for Barclays standings.. And final frontier will be world rounds of jessup, manfred, stetson, henry, and vis. # 4, What do you thing, The team won in jessups of NLU Delhi was the team who won DM Harish previous year. And to notice you, there was no moot court advisor at that point of time. And they were in 2nd year at that time. I think you should have Digene or Hajmola..
@#4, I am from NUJS. I do not agree with your comment that NLU D won the competition because they have a faculty coach. They have one ex-mooter as coach when we, the older law schools, have a lot of them helping us. Moreover, a law school that is in its third year has limitations that NLU D has so wonderfully been able to counter. Without taking anything away from NLU D's win (which is commendable for the above mentioned reasons), I think both the teams would have enjoyed the finals more in front of a different panel. None of the panelists judging JESSUP nationals knew what Article 2(4) of the UN Charter was, they ended up asking speakers the questions meant for the other side and had no clue of what was happening. I am not saying that NUJS would have won had the bench been different. But, it would have been a better mooting experience for both the teams and the audience. While High Court judges and partners of law firms are persons of considerable eminence, they are not the best persons to judge a moot on INTERNATIONAL LAW (just like Dame Higgins or Judge Simma would not be a good judge for a national corporate law moot). Congrats NLU D again and all the best to all four Indian teams for the international round. 4# ‘s comments are quite silly. It is a great achievement that NLUD without a senior batch is going to Jessup. Being an NUJS student, I can say that NUJS did this in 2002 when only in their second year of existence, a team went to the international Jessup. In 2003, (their 3rd year) they won the Vis in Vienna and I think were runners up at the international Commonwealth moot. In 2004 then won the Vis east. All of these without a single batch having passed out. I have no doubt that NLUD is going to achieve something similar or perhaps even bigger! Whether they do it without a coach or with, it really doesn’t matter. The performance when a mooter stands before hostile judges is what matter! Also, the “old timers” reason is really quite lame. Wait a minute. Where's NLS? @14, the South India rounds are yet to take place. Right. And in all probability, after the rounds, NLS will top the charts, right? National Law Universtiy Delhi has now won the National Rounds of Second Leiden-Sarin International Air Law Moot Court Competition held at Punjab University, Chandigarh. NALSAR came second and GNLU third. 4 teams qualify for the International Rounds to be held in Dubai. Last year NLUD had been runners up in the International Rounds of the same moot. Indeed, the LawAsia Moot was left out at which NLUD won by beating major law schools from Asia. And any international event is no small thing. The list has to be a little more flexible for that matter. Like my friend said in the preceding post, overlooking two international level moots is a big deal. And really it's about time NLUD got due credit. More than just "being a preference due to location". Haha, Good one. I have a vague idea that you know who i am. NLS lost to ILS in semis..hows that! Best Team and Best Researcher..clean sweep by ILS!! Best Speaker also to ILS!! Please update the MPL table asap! Pathetic [...] judging ensures that the teams which deserve to go are left sitting at home - again. Best Memo. You're having a laugh. We'll see just what ILS do at Washington, where the judging is half-decent. Instead of showing your embarrassment, you should appreciate the winning who have won the south rounds by their hard work. Jessup is not reserved only for particular teams, it can be won by any team who had done hard work. An observation.... The SAME NLU Delhi team won DM harish moot last year when a coach was NOT hired.... Im guessin the skeptics will now say that the judging was bad even there etc. anyway its nice to see good faith and support from other law schools supporting young institutions striving to achieve.